What is Arcology? How and Why is it Central? Walt Kelly's Pogo Possum says: "We have met the enemy and he is us." "Arcology" (architectural ecology) is "An ideal integrated city, contained within a massive vertical structure allowing maximum conservation of its surrounding environment." Wikipedia elaborates the dictionary's definition with examples of urban places seeking to demonstrate bipedal locomotion together with whatever pedestrian economy of scale fits that core principle., But at the same time, it takes note of arcology's popularity in utopian fiction, especially genre sci-fi. Such categorization likely has to do with the sociopolitical climate of Wikipedi itself, since it reflects what its constituents write. It can be objective, to some extent, within a context of the evolution of knowledge, cybersapce as its medium. The blog on this website is similarly contextualized insofar as it's a personal construction of my experiential/existential life: individual journalism, my observation-based recollection, a personaized notebook-as-exploration, gated entryway into a WiFi "build-as-you-go" puzzle-house. It's a pivot point for me, anchoring opportunities for topical discussions relevant to my pursuit, which is an ongoing development of an analytic study exploring how the human/social ecology of the idea of arcology at ArCosanti manifests. New questions arise constantly, For example: Does the "frugality" of arcology as an economic imperative have application in our lives? How does it do that, if it does at all? Your comments, concerns, criticisms, your co-operative spirit along with your own experiences, hopes, assumptions, reflections, your perceptions, fantasies, and concerns are important! Not only are they meaningful for you, they are needed here to contextualize a vital project: Validating, identifying, honoring the essential spirit of arcology itself. How has the idea of arcology mattered? What has been its attraction? Its integrity? What does it mean and/or maintain? How constructive have personal/professional relationships with it been? 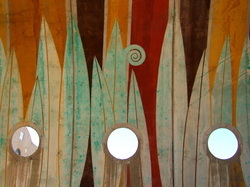 Experience of Arcosanti has presented opportunities to increase self-awareness. Will that continue to occur in the "dream-context'" that relegation to genre fiction has accorded it? Is that the best and the most that can be made of arcology? IMO don't see that as what's most necessary or what it's best suited to do. 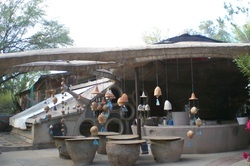 Paolo Soleri believed arcology would be a worthwhile pursuit if increased consciousness of evolution is desirable. If the future of the planet depends upon the effort of each/every sentient being to live in harmony with the cosmos, if it is incumbent upon every one of us living on this watery rock hurtling through space (at rates most of us have been schooled not to notice), we had better take no task for granted. Most especially we must not ignore an essential 'reality-check' task: affirming the interdependence of all things, which binds us within all the forces that contain us. Moreover, should we take memory (or forgetfulness) for granted, we may miss one of humanity's greatest opportunities; to LEARN TO DO GOOD. "DANGER" + "OPPORTUNITY" =s "CRISIS"
The definition is linguistically inaccurate but the idea captures an important sentiment: May we acknowledge every state of crisis we experience as we encounter it, may we learn to take heed of what we deem dangerous - even as we become aware of our opportunities. In all our endeavors, may this be of benefit to all sentient beings.